Hob. Time: 3-4 mins. For best results use the hob method. 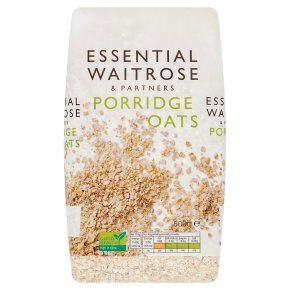 Allow approximately 40g of oats per person. Place the oats in a small saucepan and add 300ml of cold water or milk for a creamier porridge. Bring to the boil and simmer for 3-4 minutes, stirring continuously. For 2 servings. CAT B 650W - 4 mins, stir then 3 mins. CAT D 750W - 3 1/2 mins, stir then 3 mins. CAT E 850W - 3 1/2 mins, stir then 2 1/2 mins. For 1 servings. CAT B 650W - 3 mins, stir then 3 mins. CAT D 750W - 3 mins, stir then 2 1/2 mins. CAT E 850W - 3 mins, stir then 2 mins. Microwave ovens vary: refer to handbook. Place 40g of oats per person in a large microwaveable bowl and stir in 300ml of cold water or milk for a creamier porridge. heat on full power. Stir half way through. Allow to stand for 1 minute. Add sugar or salt to taste. Do not reheat once cooled.